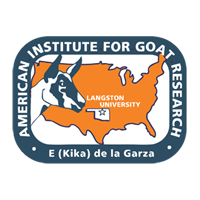 A database including 80 treatment means based on energy balance publications was constructed and analyzed to estimate fasting heat production (FHP) and ME required for maintenance (MEm) of goats. Experiments entailed comparative slaughter, respiration calorimetry or CO2 entry rate techniques. Goats were of eight breeds and five physiological states (preweaning; growing; mature and nonlactating; early and mid-pregnancy and lactating). Assuming that heat increment was 40% of total heat energy, unweighted and weighted (number of observations per treatment mean) log-log regressions (n = 74 following removal of outliers) of FHP against BW resulted in FHP (kJ) = 299 × BW0.762 (R2 = 0.82) and 244 × BW0.826 (R2 = 0.75), respectively. The 0.762 and 0.826 BW scaling factors did not differ (P < 0.17) from 0.75. The slope and intercept of a regression of recovered energy (RE) against ME intake (MEI) for preweaning goats differed (P < 0.01) from those for other physiological states. A linear regression analysis of RE on MEI (both kJ/kg BW0.75) was conducted for the remaining 71 observations, after removing two observations with greater than 2.5 residual SD. The resultant equation was: RE = -298.0 (SE = 22.38) + (0.691 (SE = 0.028) × MEI) [n = 69; R2 = 0.90]. These estimates of FHP and efficiency of ME use yielded an estimate of MEm of 431 kJ/kg BW0.75. In summary, FHP and MEm of 298 and 431 kJ/kg BW0.75, respectively, appear appropriate as general descriptors of the maintenance energy requirement of goats consuming diets at, near or above maintenance.